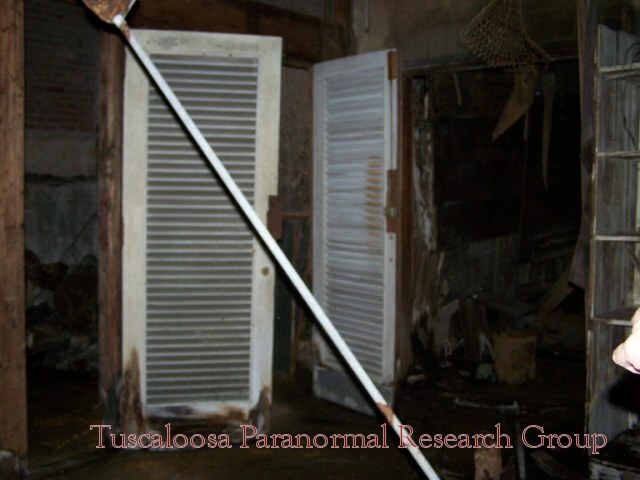 Reports of Paranormal activity at the Mansion include disembodied voices, shadow people, and unexplained noises and smell. "Get Out Now - David- I Kill You"
"Look There Out The Window"
"How Did Camera Do That?" "Don't Beat You Out The Room"
"I Want Out Of Here"
"How Can You Go Now"
"David Will You Help Me Out?" "Help Me - She Pass"
"You The One That Can Hear Us"
"You're Crying At Me - Now Go Away - Hot"
"They Can't See Me - Tee Hee Hee"
"How Can - Be Immoral - He Beat Me"
"We Can Hear You - Sometimes- Or Never- Watch Out"
"I'm Right Here Go Get Heather"
"I'm so weary and tired" - Old Lady "I'll Wait"
The investigation started with a walked around with David and Shay at the hospital making sure the structure is still safe for the team. As we enter the building we both felt uneasy about the place, like someone or something was watching us. 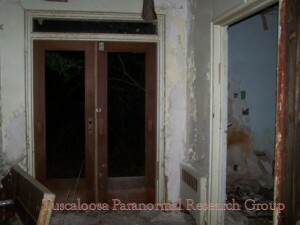 When we enter the main hall on the 1st floor we hit cold spots that continued until we got down to room 103. 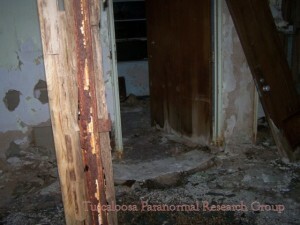 In room 103 I felt pressure in my chest and the air was heavy it felt like something didn’t like us being in that room. Room 103 has always been a great place to start the investigation with all the activity and the evidence we have gotten so far. As we reenter the hallway we notice the structure of the building was still safe, parts of the walls has been disturbed and missing but in all about the same. 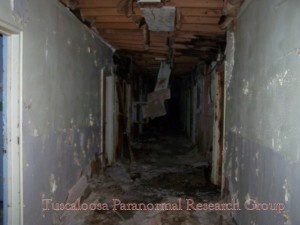 Walking down the hallway on the 1st floor I notice shadow at the end of the hall that moved right to left of the hall. 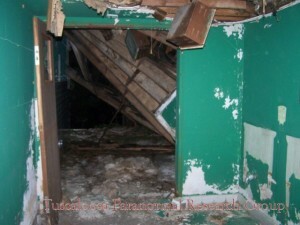 The moving shadow might have been my flashlight passing over debris hanging down from the roof, which was the only time I saw the shadow on the 1st floor. Moving upstairs to the 2nd floor we found our self in front of the nursery where we have gotten some great Evps of babies crying. At this point I was feeling very uneasy about being there just the two of us and was thinking about just waiting around for the rest of the team. 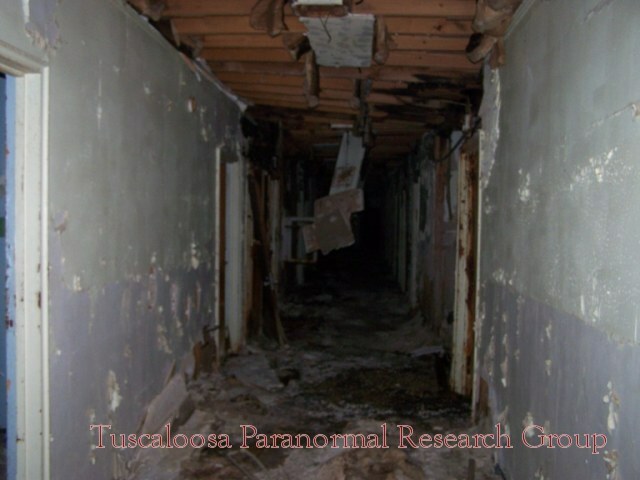 The 2nd floor of the hospital is very active with shadow people walking around at the end of the hall, footsteps, moans, and the smell of the hospital still around. We quickly finish up looking over the structure of the 2nd floor and the only thing we notice was the operating room roof looks like it fell down. As we entered the Morgue we notice that it was flooded with bout 2”-3” of water from the rain that we just had. We didn’t stay too long as we both felt uneasy and outnumbered in the water down Morgue. We enter the hospital and walked down the hall to Room 103 where we felt the same cold spots as before. Before we started the investigation Shay and Steven placed wind chimes at different locations on the 1st floor, one in the hallway the other in Room 103 with us. 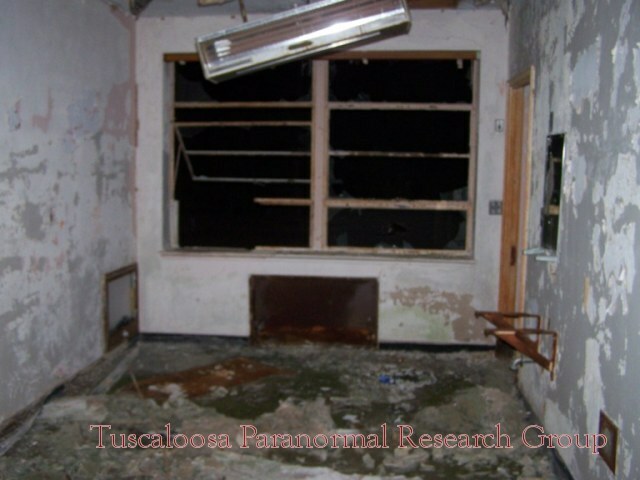 The investigation started with “Lights-Out” in Room 103 with Shay and Mike asking questions that lasted bout 20 minutes. 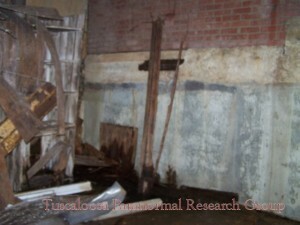 During the “Lights-Out” we heard some small pops and knocks though out the building but nothing I would call Paranormal. We asked for the wind chimes to move but didn’t get any response. 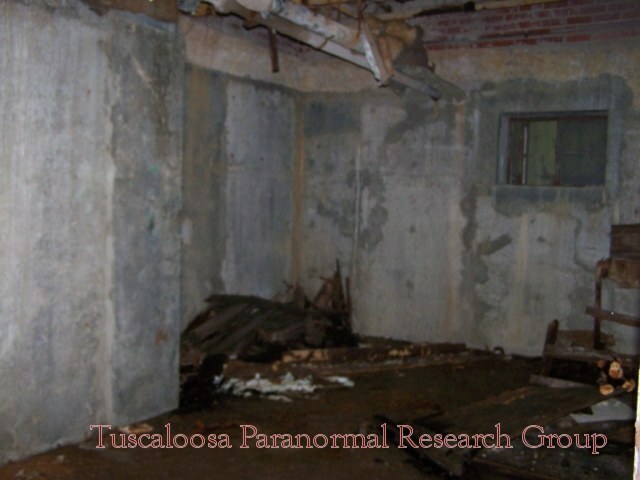 We still had an uneasy feeling in that room but not as much as we did in the Walk Around. 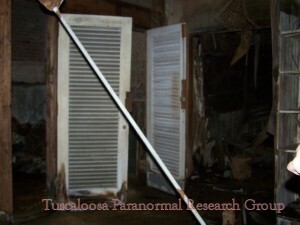 Cold spots were felt during “Lights-Out” moving round the room. We close the “Lights-Out” with a thank you and a little response back only with a knock on the left wall. We setup the investigation of the nursery with a baby doll that Steven had found and Shay moved one of the wind chimes from Room 103 to a location in front of the nursery. We started “Lights-Out” the same way of asking questions and trying to get the doll or the wind chimes to move. 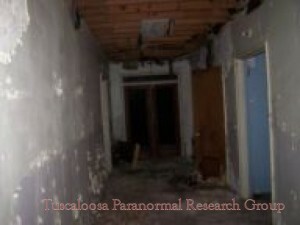 During “Lights-Out” we notice movement (shadow) down the long hallway on the 2nd floor. The shadow stayed in the same location in the hall but moving from room to room. We did hear knocks all around and movement down the hall where we saw the shadow. We closed “Lights-Out” with no response from the wind chimes or the baby doll, lasted about 15 minutes. As we moved from the nursery to the end of the hall where the shadow was moving we notice a strong smell of something burning like an electrical fire. 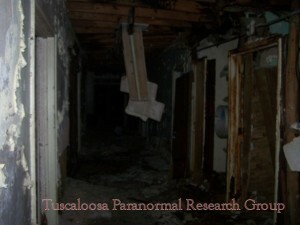 The electrical fire smell didn’t last long and was just in part of the hallway. We broke out the EMF, which moved a little down the hallway but jumped to 13 in front of the nursery. During “Lights-Out” we notice the electrical fire smell keep returning and fading back away. The heavy feeling was back about 5 minutes into “Lights-Out” and around the time Mike was touched. The shadow was gone as if he/she was playing with us, like hide-n-seek. 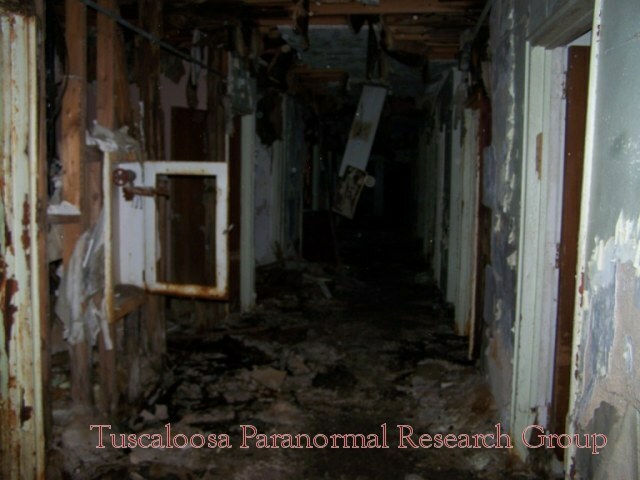 We ended “Lights-Out” with some movement in the room right and the smell of the electrical fire that we couldn’t explain. As we enter the Morgue the uneasy feeling was back as we tried to find a spot to stand for the “Lights-Out” in the 2”-3” water that filled the cold dark room. 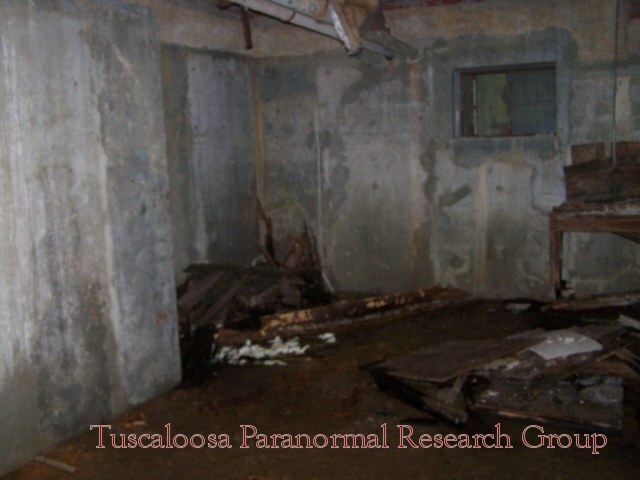 We started the “Lights-Outs” with ours digital voice recorders, EMF, and the K2 Meter hoping to get some response from whatever we found in there last time, but the Morgue was quiet that night. We ran the digital voice recorders for bout 30 minutes and asked all kind of questions. 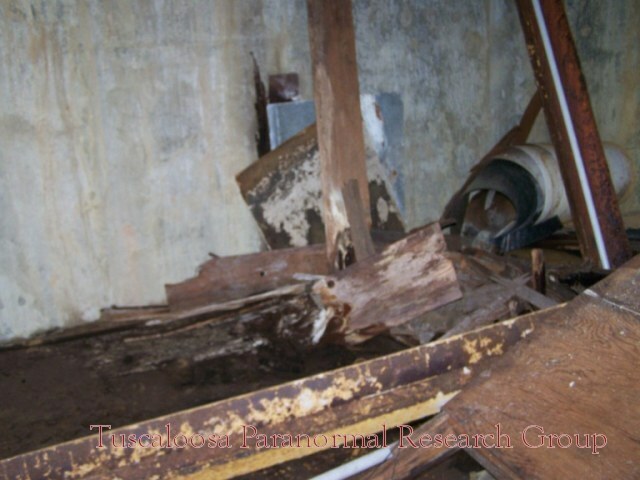 The only response that we got back was movement on the left corner of the room, which we were thinking it could be some kind of a small animal. 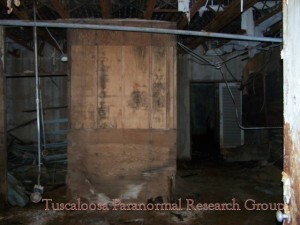 We ended the “Lights-Out” without any response back, no flashes of light or whispers like before in our investigations. 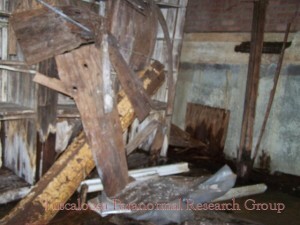 We decided to investigation the 2nd floor again because that where most of the activity was coming from. As we enter the 2nd floor we notice the doll we placed by the Nursery hasn’t moved. The uneasy feeling was back as we done another “Lights-Out” in the hallway in front of the Nursery. During “Lights-Out” we notice the same Shadow at the end of the hall moving room-to-room playing with us. We called out to it to see if it can get a little closer to us so we can make it out a little clearer. The Shadow stayed at that end of the hall while a smell of bandages filled the air. The smell of bandages has always been there on every investigation; the building was close in 75, broken windows, and the open roof in some spots there should be no reason for the smell to be still there. 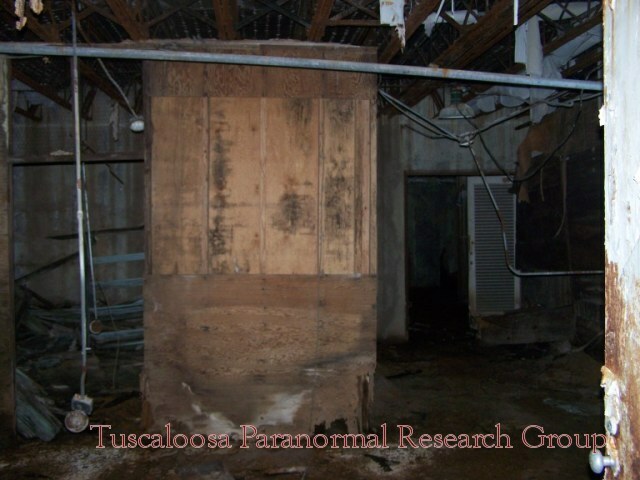 We ended the “Lights-Out” without anything on the EMF meters (maybe just jumping a little), we heard movement and saw the Shadow person again.